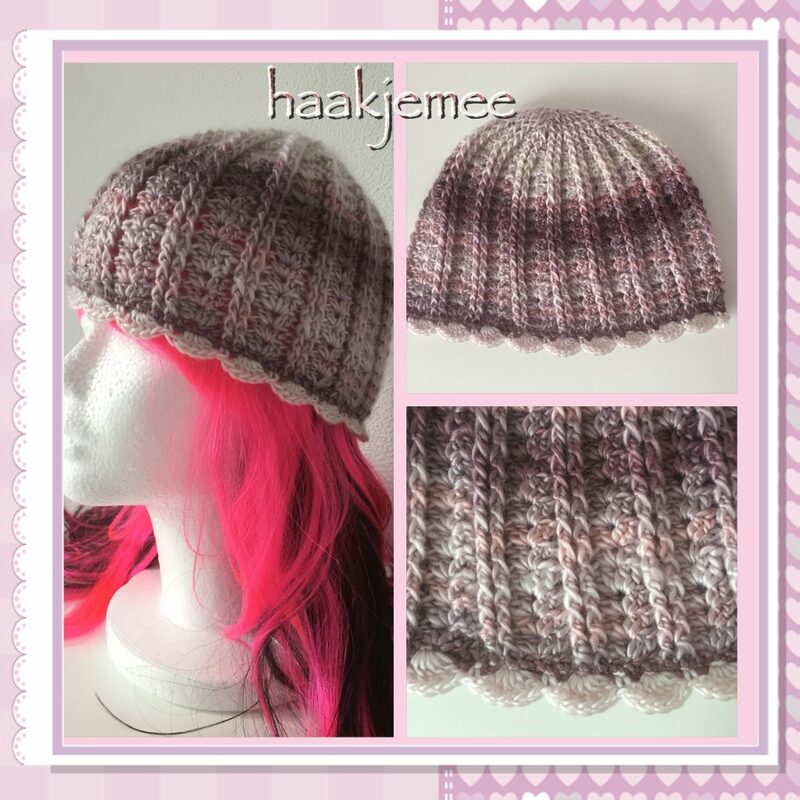 This beanie can also be made as a bun beanie. 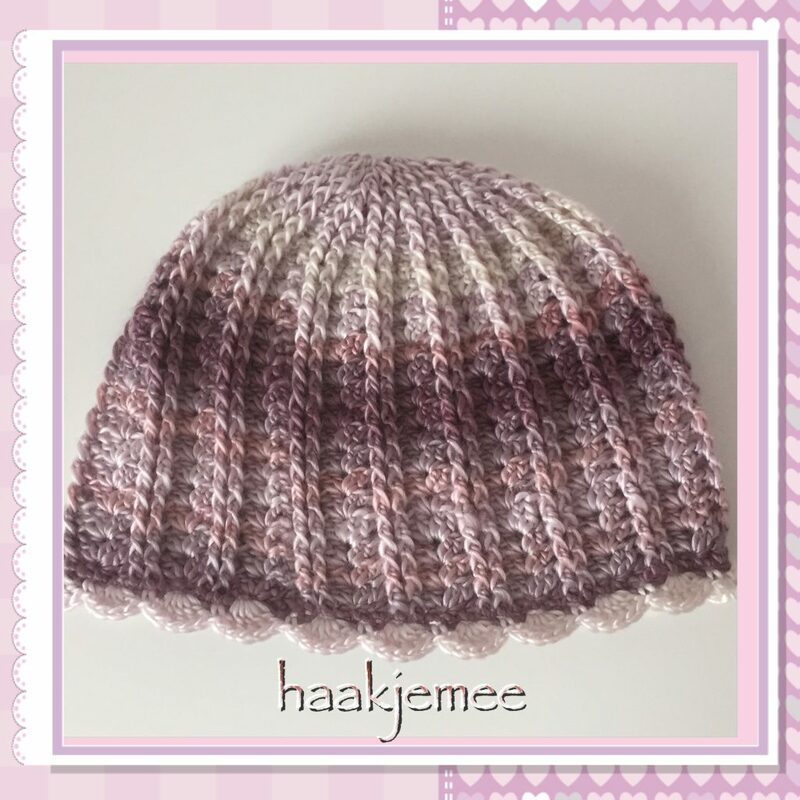 Violet shades beanie crochet pattern. Ch 80 and close to form a ring. Ch 2; *hdc in next stitch; repeat from * around and Close with a sl st in the second loop of the ch2. * 4 dc in the next st; skip the next st; fpdc in the next 2 st; skip the next st; Repeat from * around. Close with a sl st in the 3rd loop of the chr. Repeat from * around and Close with a sl st in the 3rd loop of the ch3. As round 4, but instead of fans of 4 dc, you make fans of 3 dc. The first fan is made with ch3 and 2 dc. Use a sl st to go to the space between the first and the second dc of the fan of the previous round. *dc between 1st and 2nd dc of next fan; dc between 2nd and 3rd dc of the fan; fpdc in the next 2 stitches. Ch3; fpdc in the next 2 stitches; *dc in the next st; fpdc in the next 2 stitches. Ch3; fpdc in the next 2 stitches; *skip the next st; fpdc in the next 2 stitches. If you want a bun beanie, you can stop here if the hole is large enough. You can also make the hole smaller in the next round(s). Ch3; *fpdc in the next 5 stitches; 2 fpdc tog; Repeat from * around and close with a sl st in the 3rd loop of the ch3. Ch3; 2fpdc tog all around. Close the round with a sl stitch. Close the hole with a sewing needle and weave in the ends. Attach with a sl st to a stitch on the bottom of the beanie. Repeat from * around and close with a sl st in the first sc. Fasten off and weave in the ends.